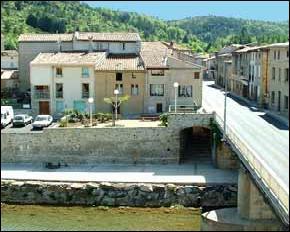 All the apartments at Gite des Cathares are very spacious (approx. 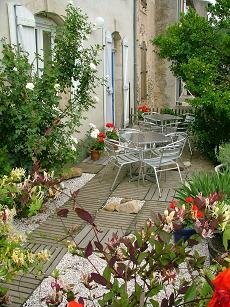 90 m2), hung with original works of art, have a large main living area with music system and own computer with free Broadband (ADSL) Internet access. This makes it an ideal base from which to find local attractions, house hunt or keep in touch with clients or friends via email. Each apartment is tastefully decorated in its own individual style and includes a kitchen / diner with washing machine, full oven and hob and fridge with freezer compartment. The kitchens also have a toaster, kettle, coffee percolator, etc. The apartments all have a separate bathroom and WC and use of the pretty south-facing terrace. They have double glazing and are designed in the French style, to stay as cool as possible in the summer and as warm as possible in the winter, with fans in each bedroom and lounge and electric heating included in the price. There is ample well-lit free parking near the gite. The ground floor apartment sleeps 2 to 4 and has a kingsize bedroom plus comfortable sofa-bed in the spacious lounge. The 1st floor apartment sleeps up to 6 and has a large master bedroom, a twin room plus a comfortable sofa bed in the light and airy lounge. It also has a dining table that expands to seat ten, so large groups can eat together in comfort. The 2nd floor apartment sleeps 2 to 4 and has a bedroom with four-poster bed and double sofa-bed in the large open-plan lounge, with a high beamed ceiling and wood-burning stove. The bathroom also has a separate bath and shower. The terrace (55 m2) is a south facing sun trap with a tree that provides ample shade in the long Mediterranean summer. The terrace overlooks the river Salz, a gently flowing tributary to the Aude, where you can watch the world go by while sipping your favourite tipple. There are also rivers to swim in, lakes and castles nearby, as well as horse-riding and bike hire. The apartments are tastefully decorated and include paintings by local artists Catherine Mascres, Vanilla Beer and Allison Carmichael. 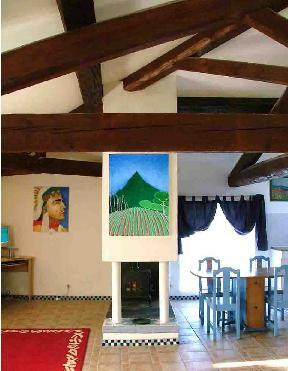 Please see the Artwork page for more examples of the art at Gite des Cathares. You can see floor plans for any of the apartments by clicking: Ground floor, 1st floor or 2nd floor. Or photos by clicking: Ground floor, 1st floor or 2nd floor. Please note that the holiday apartments are non-smoking throughout.